One of The Syndicate's top officers happens to also be a game developer and was attending GDC 2018 and went to the Ultima Panel. Richard Garriott, Starr Long, Raph Koster (Designer Dragon) and Rich Vogel were speaking. 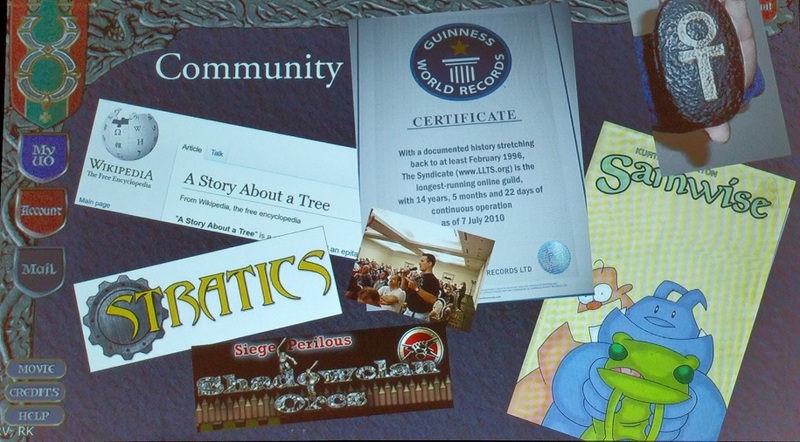 In one of their slides showing historical UO community related things and The Syndicate wsa featured on the slide.. twice.. an old Guinness World Record of ours was show (the record is much longer now).. and a picture of us at SyndCon was shown. That was SyndCon 2009.. They even asked if there were any Syndies in the audience. Of course there were. Gotta love it!